Proverb is geared towards men who lead an active lifestyle and believe that they get out what they put in! 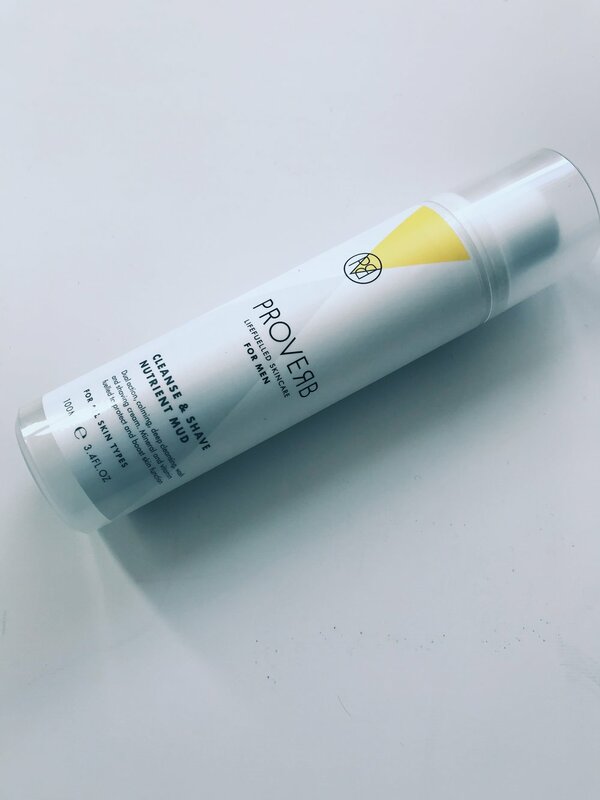 Using only clean, active, natural and organic ingredients within their skincare products such as; proteins, anti-oxidants and enzymes, all of which have been formulated for lab proven results. I took two capsules as instructed each morning with water and out of the range, I found these supplements to take the longest to notice any sort of change. I'll be honest, I'm not a huge fan of taking supplements for anything anyway so I was a little biased beforehand. However, having had these I have noticed my skin appeared brighter and with both Vitamin C and D within these capsules, I knew that these would be more beneficial for my health! You can purchase the Skin Resistance Training Supplement here. Prior to using the Cleanse & Shave Nutrient Mud, I dampened my face and then began to massage the mud into my skin. The texture of the Mud is rather thick but managed to absorb into the pores of my skin rather well and I particularly liked the citrusy scent! I noticed almost immediately afterwards that my skin felt smoother to touch and appeared hydrated! This product also doubles up to be used whilst shaving also, but as I sport facial hair, I was unable to use it for that reason. You can purchase the Cleanse & Shave Nutrient Mud here. I used this serum in the morning after using the Cleanse & Shave Nutrient Mud, and applied a small amount of the serum over my face. The texture of the serum was very smooth and was easily absorbed into my skin! Over time, my face felt firmer and more nourished. You can purchase the Strengthening Skin Serum here. Designed for all skin types, the Skin Definition Facial Scrub is a gentle exfoliator and I used this at night-time by massaging into my face, and later rinsed off with warm water. The texture of the Facial Scrub was rather light and didn't feel as rough or 'bitty' given that it is an exfoliator! I particularly like how smooth and fresh faced my skin was afterwards. You can purchase the Skin Definition Facial Scrub here. Depending on your skin type, whether it be normal, dry or oily, you have these two moisturisers to choose one which suits your needs best! As my skin type is normal/dry, I used the Hydration Pro Moisturiser as it tackled my issues. I found that the Moisturiser had a slight shine to it which for me personally was slightly off putting as I favour a more 'matte finish' to my face, however, despite this, my skin did look healthier and had a nice glow to it! You can purchase both the Hydration Pro Moisturiser here, and Oil Balance Pro Moisturiser here. Overall, the range from Proverb has a high end, premium feel to it and with the ex rugby pro & model; Thom Evans being the ambassador, it isn't surprising to see why! You can experience the Proverb 4 x 4 x 4 x 4 programme in which Thom Evans demonstrates the different products and the different movements maximising the full experience of each product! To view the programme, click here. To view the full range, and to learn more about Proverb, click here! Have you tried any of these products by Proverb before? Will you be trying any of these out? Which sounds most appealing to you? Do let me know your thoughts below, as I would love to hear from you! Also, don't forget to click the 'like' button below!